Zenith Stromberg slow to drop revs. Bypass valve? #1 Zenith Stromberg slow to drop revs. Bypass valve? Over the last year or so I have noticed the revs will stay at around 1100 rpm when taking my foot of the throttle. Occasionally at a stop light, the revs will eventually drop to proper idle on its own but usually I will have to put the car in first gear and inch forward a bit to get the car to drop to idle. My mechanic has lubricated and adjusted the trottle linkage a couple of times. The car was just in the shop where he noticed a small dent by the bypass valve on one of the carbs that he thought was allowing some air to be sucked in. He placed some epoxy in the dent which he hoped would solve the problem but there has been no change. I am thinking, maybe incorrectly, that the bypass valve itself may be the issue with either the spring or the diaphragm needing replacement. It appears the diapragm kits are easy to find and the full assemblies are sometimes available. Is this a carb off the car job or can parts be replaced insitu? #2 Re: Zenith Stromberg slow to drop revs. Bypass valve? If you want to simply remove the bypass from the circuit, make a new gasket for the side next to the carb with NO holes, that will take the bypass out of the system, its only used for emissions on deceleration. only if that solves the problem and you want to rebuild the bypass valves, then order the kits. 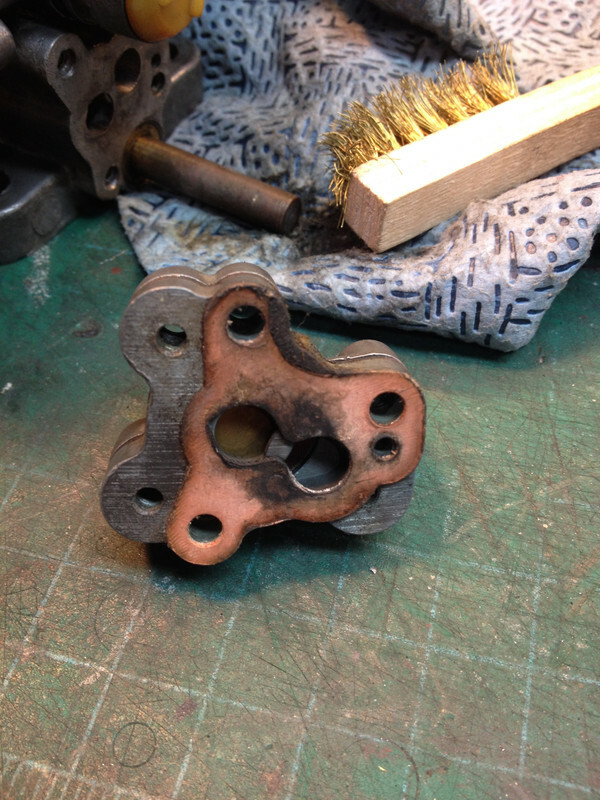 otherwise just buy some gasket material localy, lay the old one on it and trace out a new one without the center holes. IF that solves you problem, carry on, if not keep looking, others will surely chime in with ideas. #3 Re: Zenith Stromberg slow to drop revs. Bypass valve? I replaced both bypass valve diaphragms. Road test was disappointing. The car still revs at 1100 to 1500 rpms when foot comes off the accelerator. Revs drop to idle when I come to a complete stop and move forward a few feet in first. As mentioned before the throttle linkage has been lubricated several times. Carpets and floor mats pulled back to rule them out. Any other ideas what may be causing this? #4 Re: Zenith Stromberg slow to drop revs. Bypass valve? This sounds to me like the throttle linkage is sticking somewhere and is freed by the rocking of the engine when you lift up in first gear. Have you tried operating each bit of the linkage under the bonnet by hand to see if that returns the revs to idle? There's many components to the linkage and opportunities for wear and play. Check the plastic bush in the bulkhead under the wiper motor for wearing oval as a favourite to start with. #5 Re: Zenith Stromberg slow to drop revs. Bypass valve? Following with interest. I have this exact problem with my 69. BTW, we did just fix my buddy's Spitfire Stromberg idle problem by blocking off the bypass circuit, just as described above. #6 Re: Zenith Stromberg slow to drop revs. Bypass valve? Made block off gaskets last night. Installed on the front carb. Idle comes down but car stumbles a bit as it falls to 500 RPM. Will install a block off gasket on the rear carb tonight. I would assume the problem lies with the bypass valve springs being worn out? #7 Re: Zenith Stromberg slow to drop revs. Bypass valve? well, the spring could be weaker over time, but the bypass is adjustable. all the books will say don't fiddle with them and I think it has to do with emissions. as nobody will say go ahead and tamper with emission controls. BUT. you can change the settings by removing the little pressed in brass cap on the end of the long post sticking out, if it hasn't already been pried off use an x-acto knife or sharp blade and it will just pop out. If you take the whole thing apart you will see why, but thats how it works. From what I understand the idea is to set the tension to a point that there is just the right tension on the spring etc that when you are barreling along and lift off the gas, the change in manifold pressure is equalized by the bypass at a rate or manner that keeps the emissions low, Its been a while, but I think I recall reading that. I am not a carburetor expert, or professional, but between watching crazy cat videos on the net I did read a lot about them a few years ago. There are some good articles on bypass valves out there someplace. #8 Re: Zenith Stromberg slow to drop revs. Bypass valve? So I made my block off gaskets with no holes except for the screw holes. The good part is, the car no longer overrevs when taking your foot off the accelerator. The bad part is the revs drop down to 200 rpm, and the ignition light flickers before recovering to a slightly lumpy 450 rpm idle. On bfasters pic of the gasket, there is a small hole beneath the screw hole on the right hand side of the gasket as it sits in the photo. Do I need to put this hole in my gaskets? #9 Re: Zenith Stromberg slow to drop revs. Bypass valve? and you are going to need to re-adjust your idle. of course its lower, you just cut off a "leak" of air into the engine around the throttle plate. #10 Re: Zenith Stromberg slow to drop revs. Bypass valve? Idle adjusted! Feels a bit different when you take foot off accelerator but much improved from where it was. Thanks to all who helped!